Mycobacteria, from saprophytic to pathogenic species, encounter diverse environments that demand metabolic versatility and rapid adaptation from these bacteria for their survival. The human pathogen Mycobacterium tuberculosis, for example, can enter a reversible state of dormancy in which it is metabolically active, but does not increase in number, and which is believed to enable its survival in the human host for years, with attendant risk for reactivation to active tuberculosis. Driven by the need to combat mycobacterial diseases like tuberculosis, efforts to understand such adaptations have benefitted in recent years from application of activity-based probes. These studies have been inspired by the potential of these chemical tools to uncover protein function for previously unannotated proteins, track shifts in protein activity as a function of environment, and provide a streamlined method for screening and developing inhibitors. 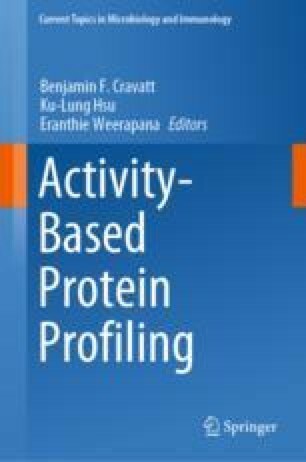 Here we seek to contextualize progress thus far with achieving these goals and highlight the unique challenges and opportunities for activity-based probes to further our understanding of protein function and regulation, bacterial physiology, and antibiotic development. We thank Dr. Benjamin Cravatt, Dr. Peter Tonge, and members of the Seeliger laboratory for helpful discussions on topics and concepts discussed in this review.